The Rook’s Nest is a two-storey Penthouse Suite with views over St Paul’s and the Old Bailey. 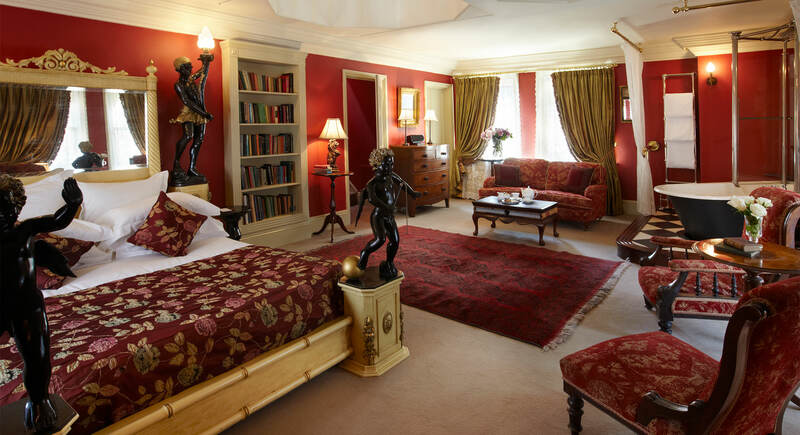 The bedroom is dominated by a marvellously ornate bed flanked at each corner by gilded blackamoors. A huge Victorian bathing machine sits on a raised plinth behind lace curtains in one corner of the room. A staircase leads you upstairs to an unforgettable sitting room under the 40ft spire. The suite is fully air-conditioned with complimentary wi-fi internet access and flat screen LCD television both upstairs and downstairs. The sitting room has a dining table, antique lawyer’s desk, mini-bar and safe.
" This is straight out of James Bond - perfect for hiding a spy or a somnolent mistress. "